The MBA Class of 1959 Chapel was a gift to the School from members of the Class of 1959. 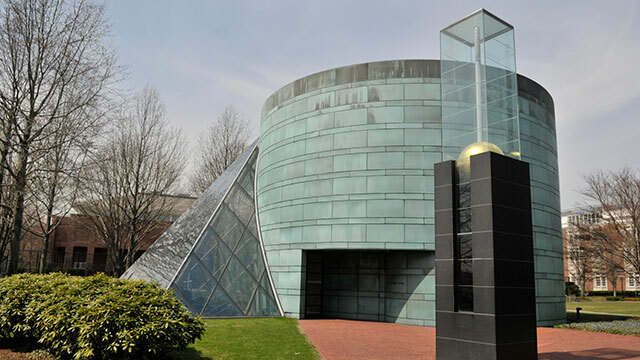 Designed by Moshe Safdie and Associates and completed in 1992, the Class of 1959 Chapel provides a place for quiet contemplation on the HBS campus. Used for non-denominational services, ceremonies, and concerts, the chapel is easily identified by its cylindrical, copper-clad, main building and adjacent glass pyramid. Visitors pass through an enclosed water garden before entering a simply furnished main sanctuary, which is illuminated, in part, by daylight refracted through ceiling-mounted prisms. Outside the chapel, the names of the members of the Class of 1959 are inscribed on a “sun clock” tower designed by German artist Karl Schlamminger. In 2011, the building achieved LEED Gold Certification for a two-year project that significantly reduced its energy and water consumption. The Class of 1959 Chapel was a gift to the School from members of Dean John H. McArthur’s HBS graduating class. The Class of 1959 committed its 25th and 30th Reunion fund-raising campaigns to the chapel project. In 1997, a chamber organ designed by Taylor & Boody Organbuilders was added to the chapel, a gift from Albert H. Gordon (MBA 1925) and George F. Baker III (MBA 1964). McArthur, who served as Dean from 1980 to 1995, believed a chapel on campus would enhance the sense that HBS is a true community, an ideal embraced by early HBS leaders. The chapel was one of three new buildings and 16 major renovation projects undertaken during Dean’s McArthur’s tenure.